Help! My Toes Go Numb When I Work Out! Have you noticed something strange when you run or when you are on the cardio machines at the gym? Do your toes go numb when you work out? If so, what can you do about it? Could foot numbness when you exercise be the cause of something bigger? Toes Go Numb While Running – Now What? 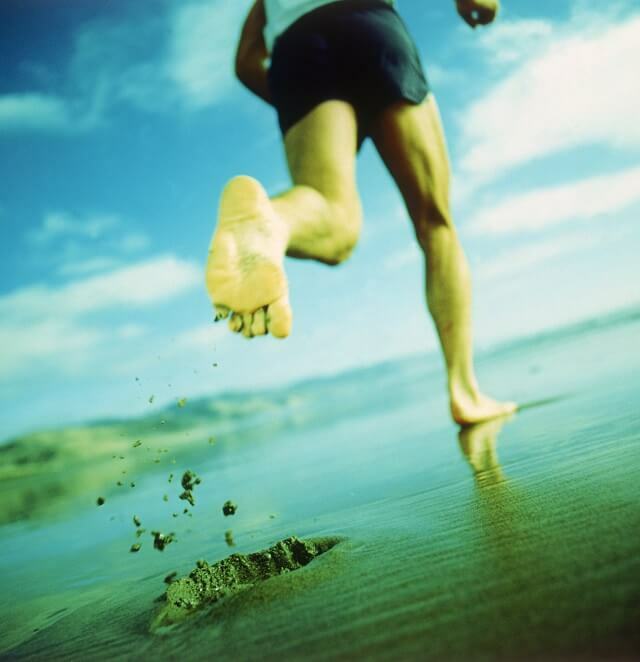 Foot numbness occurs when people, athletes or not, walk, run, or exercise on gym equipment. Common machine culprits are the stair machine, the treadmill, the elliptical, and the stationary bike. Foot numbness usually occurs when the outer two toes go numb. However, some people feel foot numbness on the outside of their foot, in the arch, on the pad of the foot, or in the heel. What does it feel like? Foot numbness actually feels like parts of your feet, especially those two toes, fall asleep. Patients report feeling a tingling sensation or pins and needles in the affected area. Some runners have reported pain, and traveling sensations that affect the ankle. Is this serious? If you experience a stabbing, permanent, or debilitating pain, you must seek professional advice from your physician. Many times, when your toes go numb it is because of nerve compression. If the heel of your foot goes numb, you may be experiencing a pinched sciatic nerve. The sciatic nerve runs down the back of your leg. If your second and third toes go numb, you may be experiencing Morton’s Neuroma. Morton’s Neuroma is caused by a thickening of nerve tissue that develops at the base of your toes. Morton’s Neuroma, also known as intermetatarsal neuroma, affects the Normal nerve. Intermetatarsal simply means: in the metatarsals. The metatarsals are the five long bones in your foot. Compression on the Normal nerve between the metatarsals can lead to permanent damage if you do not address it and take steps to reduce the compression. If you feel pain in your toes, it may simply be a problem with your body mechanics and/or pressure on the foot when you run, ride a bike, or work out on a machine. Your shoes can also be the culprit. How do you know if it is pressure and not something more? You start out by making a few changes to your routine. Take a moment to bring awareness to your body position. Starting with your feet, think about the way your feet stand on the ground. Envision your feet and try to feel the entire bottom of your foot on the ground. Where do you put the most pressure? Do you feel yourself leaning, putting too much weight on a single area, or are you slightly off balance? How far forward or back do you lean? Where is your head when you work out? Do you look forward, do you look down, does your neck bow? Do you maintain a tight core and strong back? Are you shifting your weight to one side? Body mechanics play a large role in your exercise routine. Your body mechanics can improve your performance or contribute to your pain. There are a few things you can do to help you improve your body mechanics. You can take yoga classes, get a biomechanics consultation, or seek professional training, consult a physical therapist. If you are new to running or working out, you may need to tweak your method. Common mistakes are the result of improper training, a lack of knowledge, or chronic habits that have developed over the years. Find out if you are making any of the common running mistakes. When your toes go numb, it may be the shoes. If your shoes are the wrong fit, the wrong style, or they are just worn-out, you need new ones. If your shoes are tight around the ankle or around the toes, your toes will go numb because of the compression. When you run or workout on the machines, the pressure, combined with the constant striking of your foot, can cause your poor little toes to give-up in defeat. They will go to sleep instead. Many athletes choose to wear foot orthotics and taping to address musculoskeletal injuries that may lead to foot problems during a workout. When I recommend appropriate footwear, I am talking about your daily footwear, too. If you wear high heels, the numbness between your toes may be the result of wearing those heels you love so much. Ditch the heels for a week or two and see if that provides you with any relief. Do you hit jump right on the machines or begin to run as soon as you start your workout? If so, take a few minutes to warm-up and to stretch. When you warm up before you workout, you increase blood-flow, reduce the risk of injury, and decrease muscle stiffness. Take a look at the 4 tips for a successful warm-up. Work with a personal trainer. A personal trainer will address all of the aforementioned tips. With a personal trainer, you will learn how to use the equipment and how to regulate your routine. A personal trainer can make suggestions about the gear you need and your body mechanics. Physical therapy is also a solution for many who experience numb toes when working out. Numbness is a sign that something is not right, and a physical therapist can help you make changes to relieve tingling when you run or work out at the gym. Talk to your physician about physical therapy to alleviate foot numbness and to prevent it from recurring in the future.